This is the portal page for the Support Debugging Tool for Microsoft Dynamics GP. Those of you who attended Microsoft Convergence 2011 Atlanta will know about the promised Build 15 of the Support Debugging Tool for Microsoft Dynamics GP. Well it is finally here with over 80 changes to the code. It includes lots of new functionality as well as many fixes and improvements. This build can be installed over the top of any existing installed build without needing to remove the old build first. Fixed Dictionary Control to not enable triggers for all products unless Dictionary Control is actually in use. Fixed Call Stacks in Use Error when using Reject Script option on the Automatic Debugger Mode Setup window. Fixed Tab Sequence and focus changes for Automatic Debugger Mode Setup window. Fixed error when Non-Logging Mode Triggers captured Table dumps and record dumps to xml files. Fixed Script Find and Replace to mark window as changed when text is replaced. Fixed Automatic Debugger Mode Setup window to change to Script tab when using Script menu commands. Fixed ScreenShot temporary files not being removed when emailing without using preview Send Email window. Fixed System Status to show number of products and correct product name for GP 2010 onwards. Fixed Series not showing correctly in Resource Explorer for resources with a series greater than System. Fixed Resource Explorer displaying folders for resources currently hidden from display. Fixed Drill back to Resource Information window from Security Profiler Window for non-resource Security Objects. Fixed Dictionary not changing when selecting Table from the Tables containing Field Lookup. Fixed handling of Maximized windows when remembering window state. Fixed issue with more than one User ID and/or Company ID prefix being added to Window Titles. Fixed Conversion of inline comments (--) on last line with no final carriage return on SQL Execute window. Fixed handling of Excel Report Builder Security Objects, which were added for v10.0 Service Pack 2 or later. Fixed issue with Extender Enterprise by adding check for Microsoft Extender vs Extender Enterprise as internal resources are different. Added Logging Defaults to the Administrator Settings window. Added functionality to allow selection of which logging options are used with Manual Logging Mode. Updated Automatic Debugger Mode Setup window to use tabs to allow additional actions and options. Added Menu Explorer lookup to the Automatic Debugger Mode Setup window. Changed Automatic Debugger Mode to allow Keep Focus and Restore Value options to work without Reject Script. It has been a while since we had a new build of the Support Debugging Tool for Microsoft Dynamics GP. So we have decided to release Build 14. This is primarily a maintenance release with bug fixes, minor enhancements and a couple of new features. This build can be installed over the top of any existing installed build without needing to remove the old build first. Please note that this is the final release for version 9.00. Changes to Reject Script functionality in Advanced Debugging Mode to restore fields to their previous values. Changes to Reject Script and Reject Record functionality so it can be controlled by using the OUT_Condition variable. Fixed Non-logging triggers disabling Manual Logging Mode and Automatic Debugger Mode. 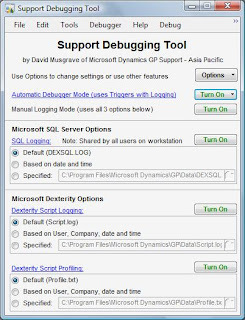 If you attended the Microsoft Dynamics GP Technical Conference 2009 in Fargo, North Dakota or Microsoft Dynamics Convergence Atlanta 2010, in Atlanta, Georgia you might have seen a demonstration by Mariano and myself of the Support Debugging Tool for Microsoft Dynamics GP. One part of the demo was how to solve security privileges errors using the tool. It is a perfect example of how the tool can make administration for a Microsoft Dynamics GP system so much simpler and this is why many partners are now installing the tool on all workstations of all their customer sites. This post is an update to the How to resolve Security privileges errors post which is part of the Microsoft Dynamics GP Application Level Security Series of posts, and is designed to highlight some of the features added since the original post was written. The following is a real life scenario showing how the Support Debugging Tool for Microsoft Dynamics GP with the Security Profiler and Security Information features can quickly resolve Security Privileges errors on a live system. In our scenario, the user is receiving a security error, but the window they were trying to open still opens, however, the window that opened does not include some fields added as a customisation. We are assuming that the Support Debugging Tool is already deployed to all workstations on the system. I had been planning to write this post after I was able to resolve a recent support case really quickly using the Support Debugging Tool. Then Christina wrote her post on Troubleshooting Tips and Tricks and it makes this post even more relevant. 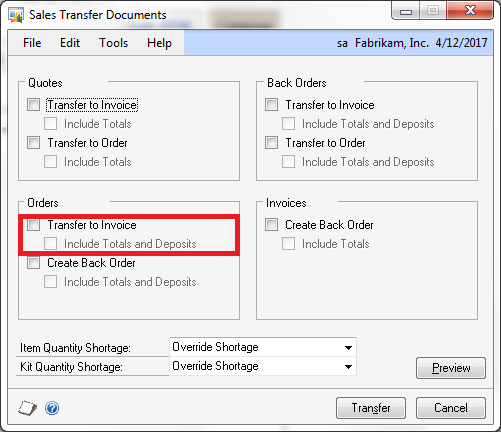 The case I was working on was an error dialog generated on the Receivables Cash Receipts window. However, if the window was opened directly from the navigation pane or menus, there was no error. If the window was opened using the Transaction Button from the Receivables Batch Entry window, the error dialog was generated. As per standard procedure, we always ask if there are any customizations involved, and were told by the partner that there were no customizations to the Receivables Cash Receipts window. Common Support Debugging Tool Myths - Fact or Fiction? I have just returned from Microsoft Dynamics Conference 2011 Atlanta conference, and based on the feedback during the sessions that Mariano and I presented as well as comments from the session evaluations, I thought it would be worth discussing some of the common Support Debugging Tool (SDT) myths. FICTION: Once you have the archive zip file for your version of Microsoft Dynamics GP, just copy the files into your Microsoft Dynamics GP application folder (need at least the Debugger.cnk and Debugger.pdf) and launch Dynamics GP using Run as Administrator. Copying the Debugger.pdf allows the F1 key to open the User Guide from inside Dynamics GP. Note: You need to give all users access to the MBS_DEBUGGER_USER Security Role to use the standard mode features. The upcoming build 15 or later builds will offer to apply this security change for you. FICTION: No setup is required, however to get the most out of the tool, it is best to use a central location of the Debugger.xml setup file. The Debugger.pdf User Guide manual has a section on Recommended Configuration which gives step by step instructions with screenshots on how to configure the SDT to use a central location. Just use a folder in the same path you use for OLE attachments for Notes. FICTION: The SDT can capture logs either manually or automatically, but that is only a small part of the overall functionality and features of the tool. As the SDT does not need to change Dex.ini settings to capture logs it can capture logs without having to exit the application and come back AND it only captures for the current instance of the application. If you change Dex.ini settings on a Terminal Server it can affect all instances from multiple users. FACT & FICTION: To capture logs or perform most features you can install the SDT on only one machine, BUT to get the most out of the tool including the centralised administration functions you should have the SDT installed on all workstations AND use a central location for the Debugger.xml setup file. FACT: To get the most out of the SDT, you should have it installed on all workstations in your system. Features such as differentiating companies using colour coding and changing the window Title will only work if the tool is installed. Also, if you have to exit to install the tool when you have a problem, you might not be able to reproduce the issue once logged back in. Having to tool installed and waiting means it is there when you need it. I am currently working on a support case where the customer is making use of the six user defined categories for items. That in itself is nothing remarkable or worth blogging about. However, they are using Long Description field on the Item Category Setup window and wished to include the data from this field onto reports. That's the difficult bit. The Item Category Setup window (screenshot below) is opened from the expansion button for User Category on the Inventory Control Setup window (Microsoft Dynamics GP >> Tools >> Setup >> Inventory >> Inventory Control). The problem with getting these fields to display on a report is that there is no way to create a relationship to the IV_User_Category_SETP (IV40600) table from the array of Item Category Values fields stored agains the IV_Item_MSTR (IV00101) table. The reasons is that the Item Categories are stored using a primary key of an Item Category Number (1-6) and an Item Category Value. To create the relationship, we need to provide both the Number and the Value, we can get the Value from array field, but there is no table field containing the Number and the relationship functionality of Report Writer does not allow a constant value to be provided. I checked the Dynamics.dic source code for a Report Writer function to be able to access this data and none were available. In fact, the Long Description field for Item Categories does not appear to be used anywhere else in the application. The 6 functions; rw_ReportStart(), rw_ReportEnd(), rw_TableHeaderCurrency(), rw_TableHeaderString(), rw_TableLineCurrency(), and rw_TableLineString() are placeholder functions in the core Dynamcis.dic dictionary. They contain no code (just parameters), but are available for Dexterity developers to trigger against and return data to a report. More times than I care to count I have been called in to fix records left behind because the Include Totals and Deposits option was not marked when transferring a sales document from an existing order to an invoice. The problem is, it is so easy to forget to mark that box if you are doing this for hundreds of transactions fractured in multiple batches, especially at the end of the week when invoices need to be submitted to customers, prior to the FedEx truck arriving at 4:00 PM. While this "fix" has been provided as a Modifier with VBA project before, I thought, why not really prop this up a bit with a Support Debugging Tool non-logging trigger and take advantage of the Automatic Debugger Mode functionality? Well, I have done just that! As mentioned in the post, Support Debugging Tool Build 15 released, the Support Debugging Tool for Microsoft Dynamics GP build 15 was released at the end of June with a build labelled as Last Modified: 28-Jun-2011. Fixed ScreenShot processing dialog covering screenshot captured bitmaps. Fixed Menu Explorer button not repositioning correctly when Automatic Debugger Mode Setup window resized. Fixed initial position for Support Debugging Tool Main window not opening in bottom right corner. Today, I will touch on the topic of Automatic Debugger Mode and non-logging triggers again. However, this time I will show how you can use non-logging triggers in combination with logging triggers to capture vital application logs upon the occurrence of some Microsoft Dynamics GP application event without user intervention. This may sound a little esoteric, but the concept is simple. 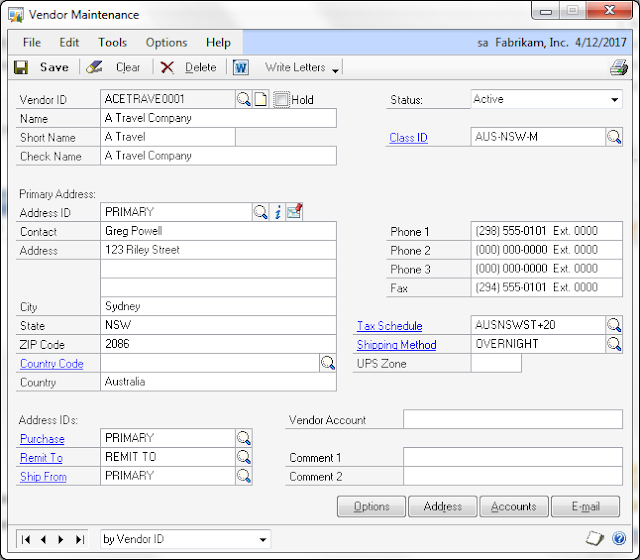 For this example we will use the Vendor Maintenance window, a very familiar window to most of you who interact with Microsoft Dynamics GP on a daily basis. For this example, we will register two non-logging triggers on the Vendor Maintenance form: the first non-logging trigger will start up a logging trigger that initiate application events logging - DEXSQL.LOG and Dexterity Script Log for this example - when the Hold checkbox is activated. The second non-logging trigger will stop the logging trigger upon closing the Vendor Maintenance form.